We have used several different dewormers and unfortunatly we have had worms later because it did not kill all the worm or eggs. Also worms can become immune to some dewormers. We currently use either Panacur or Safeguard for the 4 major worms that infect dogs. Roundworm, Hookworm, Whipworm, and Tapeworm. I suggest buying the 1000ml to save money intead of buying the packets at the vet. Be aware when buying the cattle & goat wormer it does not state tapeworm on the indcation sticker because cows and goats do not get the Tapeworm ( Taenia Pisiformis ) like a canine, but the fenbendazole kills all 4 worms dogs carry. Safe-Guard is the same as Panacur. Both products have 10% fenbenzedole. This is given 3 days in a row. The advantage of the liquid suspension is that you can be sure that they got the entire dose. It DOES kill TAPEWORM ( Taenia Pisiformis ) from fleas, other worming medicines do NOT kill tapeworm. Safe for late pregnancy females, lactating females and puppies. 70 pound dog would use about 16 ml. over 3 days of dosing, you use 48 ml. The Tapeworm is really not a worm but actually a parasite. 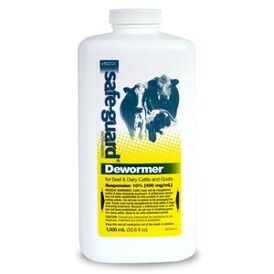 Regular demormer from a vet or animal feed store does not kill and remove the parasite or the eggs. The common tapeworm of dogs is Dipylidium caninum. Fleas and lice cary eggs that hatch tapeworms after the dog ingests the flea. A dog must bite or swallow an infected flea or louse to acquire the parasite. Another way to get tapworm is from mice, and rats.